The wild third, which also featured a booming hit from Jake McCabe on Jets star Patrik Laine and two melees, ranks as one of the most entertaining periods inside the KeyBank Center in recent years. The victory, just the Sabres’ 15th in 39 tries, felt like it could be a turning point in what has recently seemed like another lost season. So what happened? How did the Sabres, who needed almost 12 minutes to register their first shot of the second period, tilt the game so quickly? 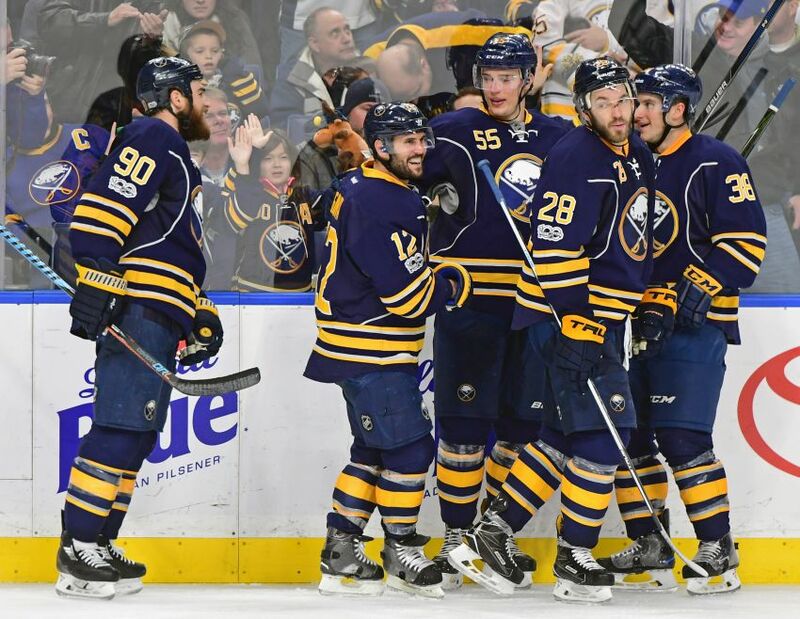 Marcus Foligno scored on a breakaway 5:12 into the third period, Zemgus Girgensons followed at 5:38 and Brian Gionta put the Sabres up at 9:54. But the genesis of their comeback might’ve come during a TV timeout late in the second period, when Bylsma, normally a cool customer, lit into his team. The Sabres generated some late momentum, then got a critical goal after Cody Franson fed Foligno. That momentum created some emotion. Girgensons yelled after he tapped Matt Moulson’s rebound in. Gionta celebrated with a fan through the glass after he held the puck, drew Connor Hellebuyck down and beat the sprawling Jets goalie. So was McCabe’s wicked but clean hit on Laine 5:48 into the third period. As Laine, who already has 21 goals, tried to grab a pass in the neutral zone, the defenseman stepped up and flattened the rookie, whose head hit the ice. While Laine lay motionless on the ice, possibly out cold, the Jets swarmed McCabe. Somehow, only Winnipeg’s Mark Scheifele received a penalty, a roughing call, from the scrum. The Jets had no update on Laine, the second overall pick in 2016. The hit might’ve been the most memorable – and hardest – by a Sabre since Brian Campbell’s memorable annihilation of Philadelphia’s R.J. Umberger in the 2006 playoffs. “That was a big collision,” Bylsma said. Clearly, the Sabres fed off the hit. The Sabres, who also erased a late two-goal deficit and beat Los Angeles 6-3 on Dec. 16, have scored 32 of their 88 goals in the third period. When the final horn sounded, a brawl almost erupted and the 6-foot-4, 239-pound Lehner nearly fought 6-foot-5, 260-pound Dustin Byfuglien after the Jets defenseman went after McCabe. Byfuglien knocked Lehner’s mask off, but a bout for the ages never materialized. Since the Jets had pulled Hellebuyck, Bylsma had no problem with Lehner joining the fray.